Karen from Where is my seam ripper? Thanks for your great posts -- they were a lot of fun to read. And congrats to the winners! Please send me your best email contact information for me to pass along to the contest organizers. Hmm. 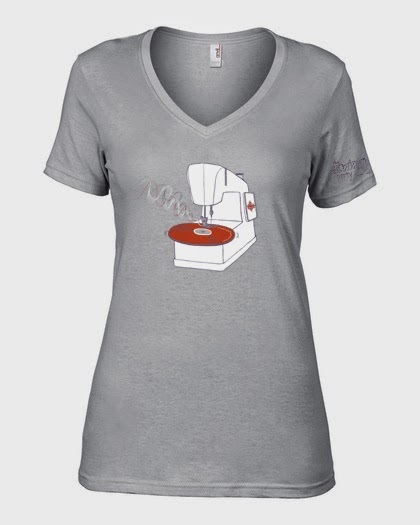 I wonder if it comes in my size. And shape. Which does not resemble an hourglass. Hope to see you at the party. I'll bring the beer bong! 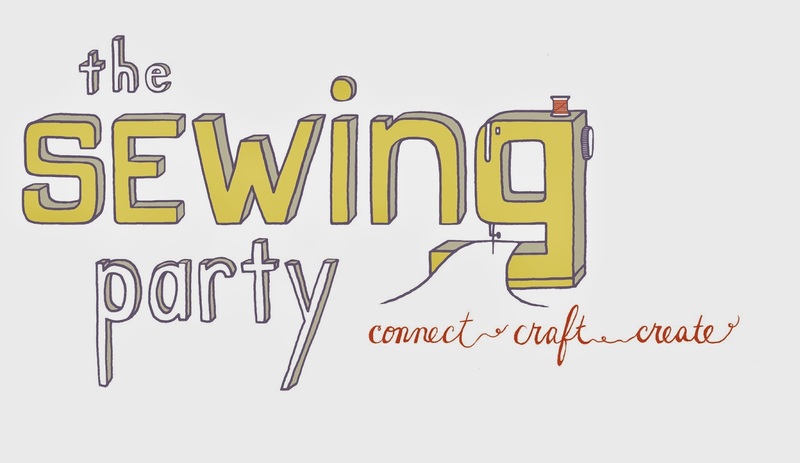 Official sponsors of The Sewing Party. I'm back today with three more quilts from Beyond Neutral: Quilts Inspired by Nature's Elements. Next up is Cayucos, from the water chapter of the book. This quilt was inspired by the very popular zig-zag quilts that have been around for a few years, but I also wanted to put my own unique spin on it. 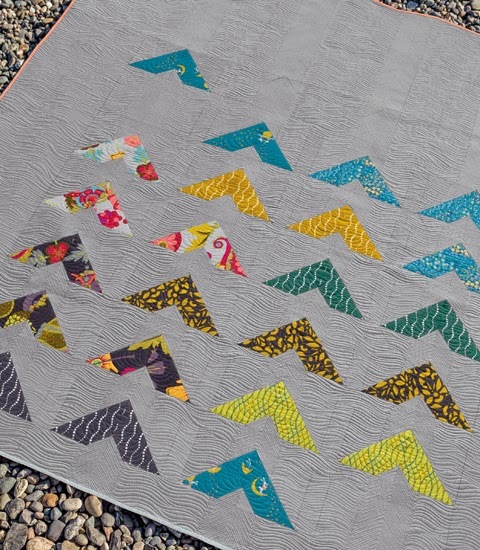 Two things I love about this quilt: the arrowhead designs that emerge as a main design element, and the basic squares that evoke traditional patchwork and allow you to feature a favorite fabric range (mine is Modern Meadow by Joel Dewberry, one of my long-hoarded collections.) This is a quilt I'd love to see made in all solid fabrics. 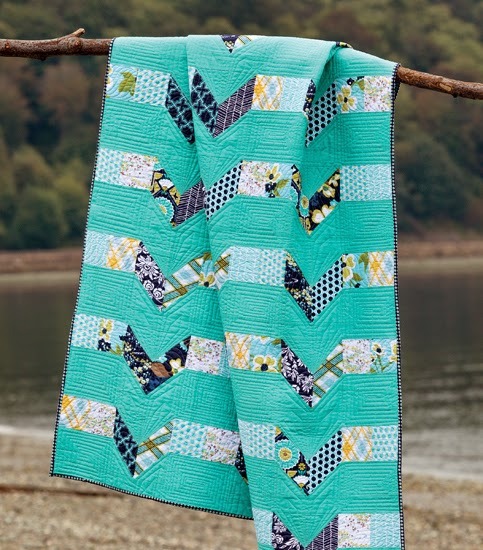 Our last quilt for today is Glacier Bay, from the wind and sky chapter. This was my attempt at creating a pattern where modern and traditional can merge. 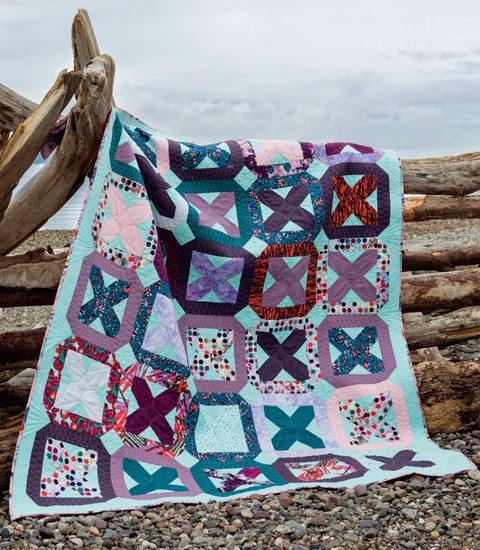 Glacier Bay is traditional in that, unlike most of my quilts, it comprises a single block pattern laid out in a consistent, repeating pattern. At the same time, its unique color palette and contemporary prints make it accessible for the modern quilter. I guess this was my way of saying "let's drop the labels and just make beautiful quilts!" And finally, from the "made from Beyond Neutral" file comes a quilt top from Jill Evans, who took my class at Q First for Quilting in Lexington, KY last month. Here's her Pacific Crest quilt top. Isn't is gorgeous? Thanks, Jill. If you've made anything from Beyond Neutral, I'd love to see it. Please send me photos and I'll share them here on the blog. And if you're enjoying the book, Amazon reviews are always appreciated! Let's continue on our tour of the quilts from my book, Beyond Neutral: Quilts Inspired by Nature's Elements. So far I've shown 6 of the book's 16 quilts, and today I'll reveal three more. 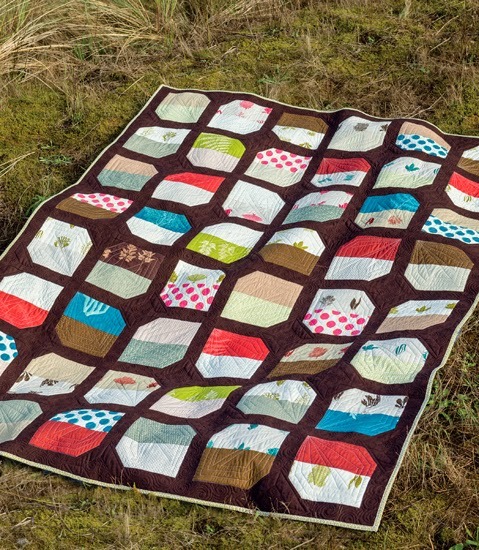 The quilt pictured above is Glimmerglass. 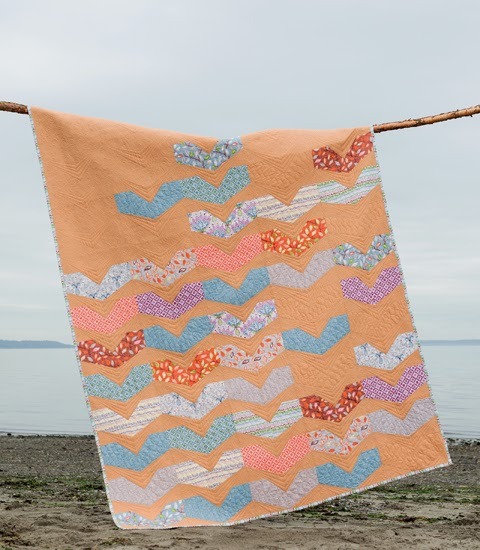 Eagle-eyed readers may recognize this quilt as Carousel, a quilt I designed in 2011 for Fat Quarterly. Carousel really worked well as a juvenile quilt, but when it was time to start pulling the book together I wanted to give it a new life. I brushed off the pattern and remade the quilt using Tula Pink's The Birds and the Bees line. As I suspected, the fresh fabric choices breathed new life into the quilt and allowed it to feel right at home alongside the others in the book. This is Fallen Timbers. Fallen Timbers is actually another pattern reissue. It was originally published as Sanctuary in the second issue of Fat Quarterly. Again, I felt the pattern deserved an update and the quilt a refresh. Now Fallen Timbers sits comfortably in the Grass chapter of Beyond Neutral. I don't think I could love this fabric combination more. 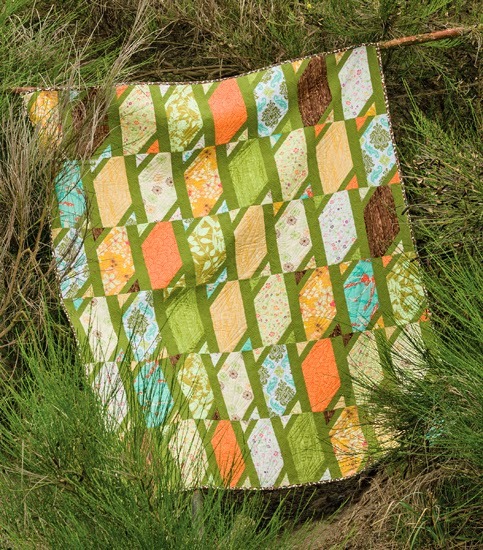 And introducing perhaps my favorite quilt in the book, Pinnacles. It was designed to feature a large amount of negative space and to showcase a select few favorite prints. I chose a mix of Alison Glass' fabric paired with some whimsical Japanese prints, all against a stone grey. I'm so pleased with how it turned out. As always, I am not above asking for some help. Amazon reviews really do help with book sales so, if you're enjoying the book and are so inclined, please consider leaving a review. I truly appreciate it. 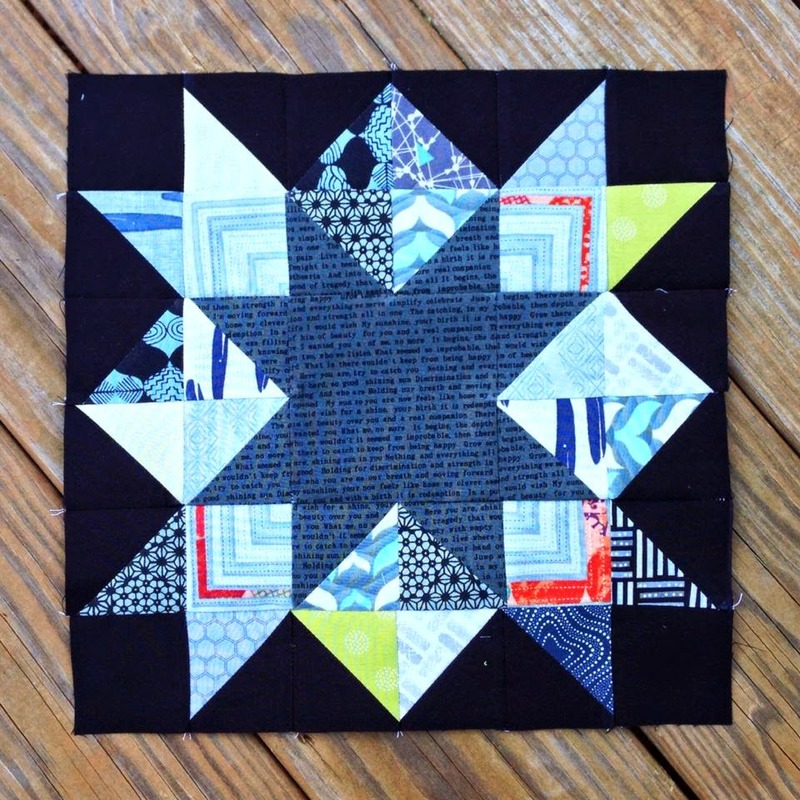 And if you've made anything from Beyond Neutral, please send me photos of your quilt tops. 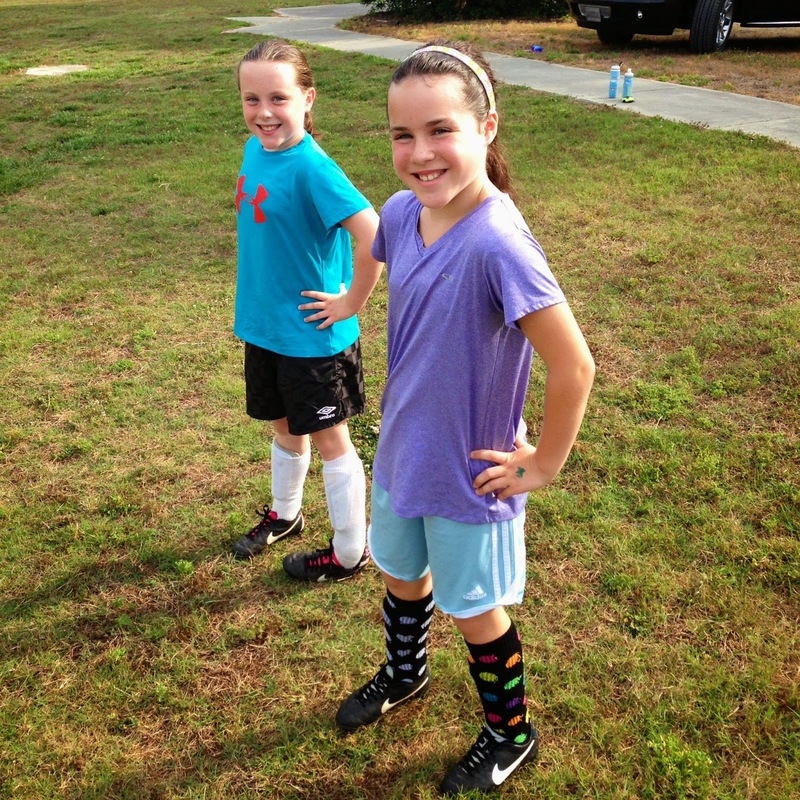 I'd love to feature them in future posts! 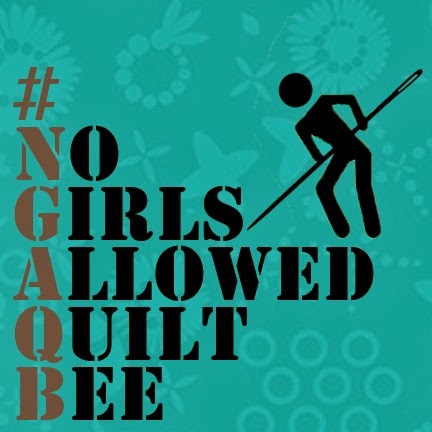 May was my #SDQAL partner-in-crime's month in the No Girls Allowed Quilting Bee. 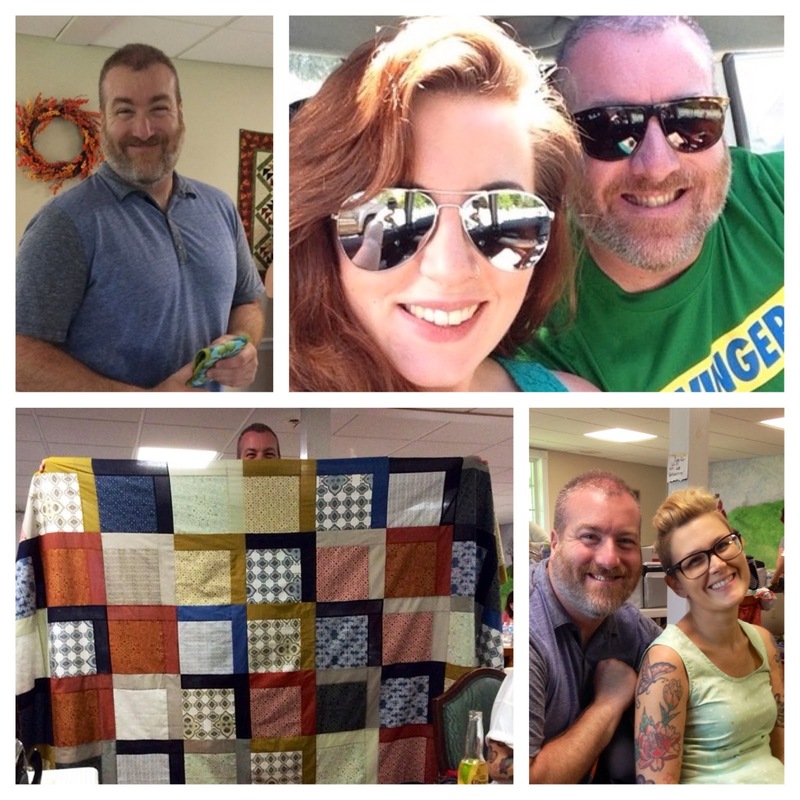 I've had the pleasure of getting to know Paul (blog: Evildemondevildog Quilts) since the bee started several months ago, and I am awed by his talent and creativity. Paul Hallinger, born in New Jersey. I am the product of a very nuclear family - dad, mom, me, and my sister. I am the older brother. Just a rather mundane childhood of growing up watching Japanese cartoons and Dr. Who. Oh, and Monty Python. And I was one of those 'studious' types who would much rather take home a 100 book reading list for the summer. And if my aunt would lend me her books on UFOs, psychic phenomenon, and otherworldly things, I would fit them in alongside The Great Gatsby. I graduated from high school and went off to college. Well that was an interesting thing to do. I lived in a co-ed dorm, found more fun than I could possibly ever want to experience, and decided that if majoring in forestry meant I had to learn latin, well, that was not going to happen. So after a fun filled year at a small liberal arts college in northern New Jersey, I dropped out. And then I just explored new and fun experiences. I worked at various jobs, hung out at clubs with friends, got into CBGBs, became enamored with punk, double pierced my ears, got a tatoo, and colored my hair a lovely shade of blue after spending months looking like Rutger Hauer in Bladerunner. I would not trade those life experiences for anything. And Doc Martens ruled. I eventually went back to college (I think I was 26 or so), working full time and going to school full time. I majored in sociology with a minor in psychology and I am that person in the room who doesn't say much but is intrigued by everything going on around him. And then off to grad school in the wonderful land of California. I spent two years getting my masters, buggered off the phD (eternal studentdom was not for me) and took a job with the Federal government in 1991. Been there as a day job ever since. I have lived in Jersey, California, Missouri and am now back in Pennsylvania. I have been with my one true love for 26ish years now - our first date involved a trip to the dump. A true romantic that one. We both remember the movie we went to see and the fact that I didn't go home. And never left much after that either! My quilting is like my musical taste - punk funk other junk, classical jazz industrial pretty much anything I listen to and like. So I quilt things I like - I don't confine myself to any particular style. I do tend to be a little 'matchy' with my fabric choices and tend to stick to one or two choices in a quilt - I personally feel that the fabric designer did what they did and I should let their expression stand relatively sound. When I look at some stuff produced by other quilters I just start hearing "One of these things is not like the other, one of these things just doesn't belong...". My own personal aesthetic. I need some level of cohesion. 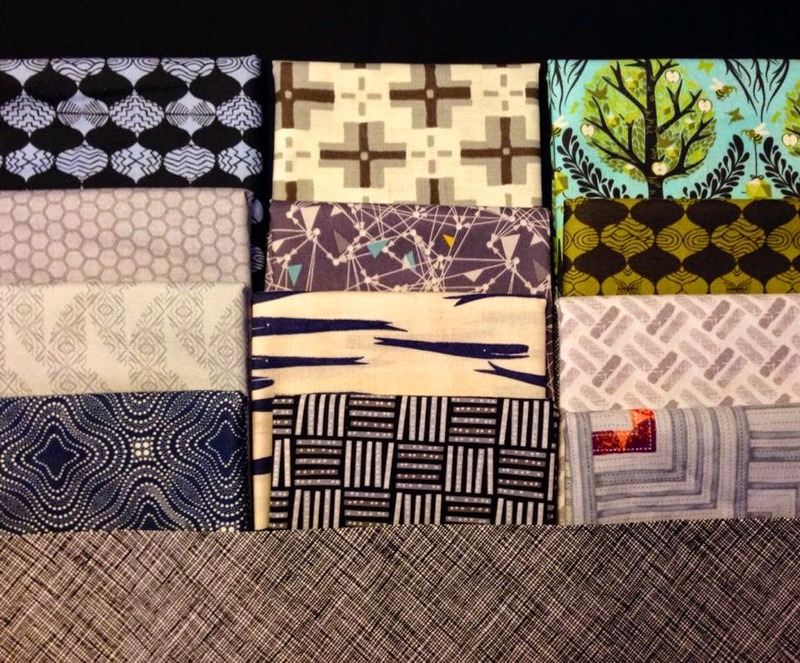 Paul's block request was wide open: he asked us to make any 8" block at all that represented us as quilters. A signature block, if you will. 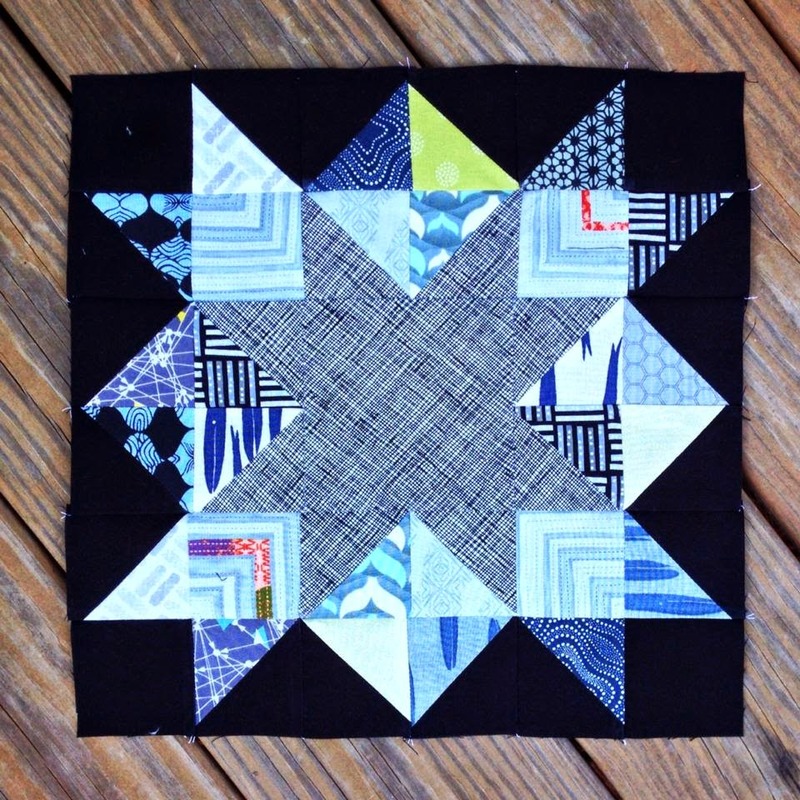 He is sure to have a wonderfully eclectic sampler quilt at the end of the bee! 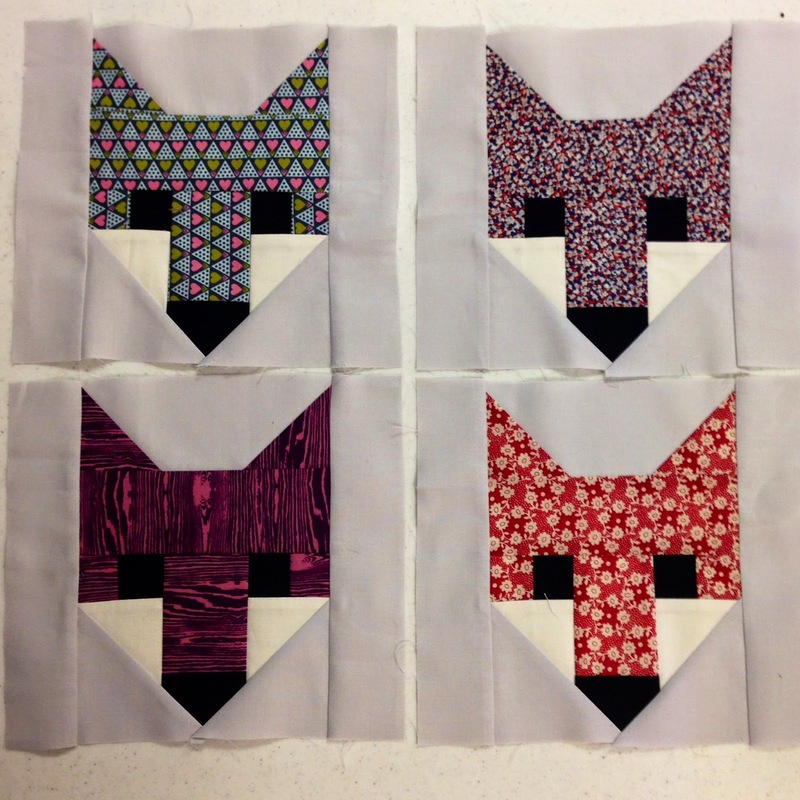 I decided to make Fancy Fox face blocks from Elizabeth Hartman's fantastic pattern. For two of them I used part of my coveted Liberty of London stash, and for the others I used a new Anna Maria Horner print and a Joel Dewberry woodgrain in a lovely shade of deep purple. Hope you like them, Paul! 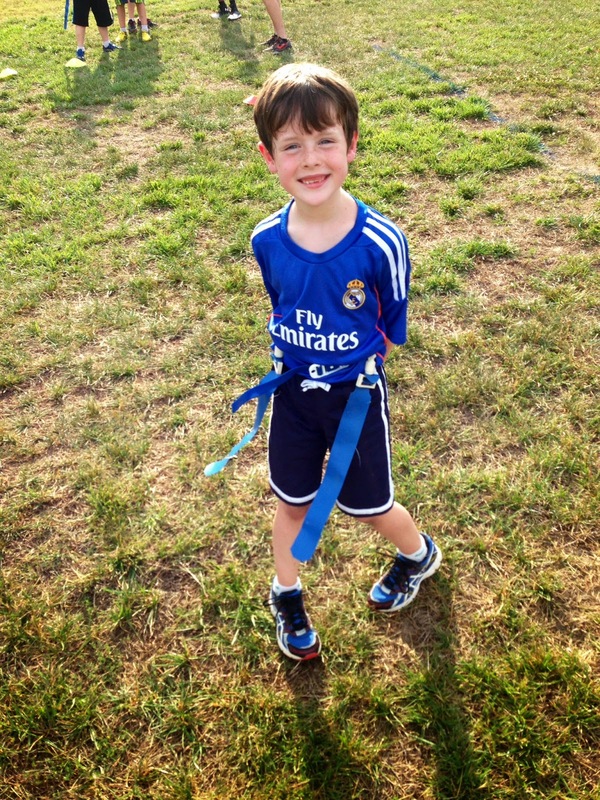 You can't really get a glimpse into my world without understanding just how much time we spend on sports fields. 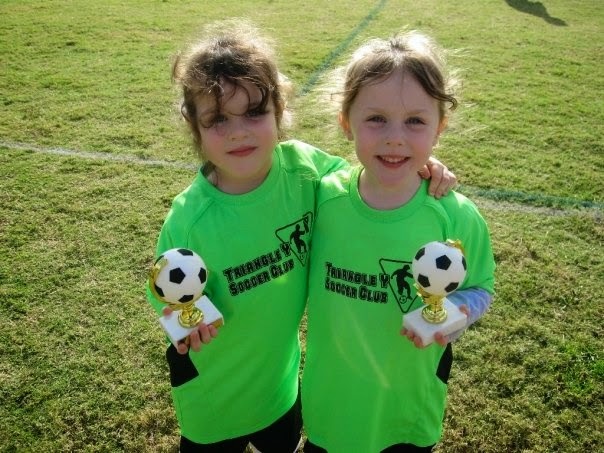 My children are all developing into exceptional athletes, and while they dabble in basketball, flag football, and volleyball, the sport of choice for all three is soccer. 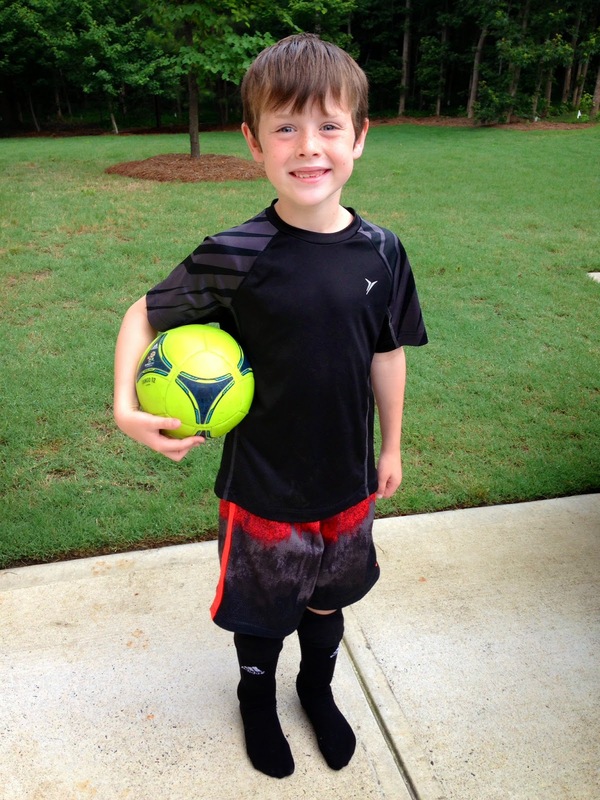 This summer, we're thrilled that all three of the kids have been chosen for their respective traveling soccer teams. 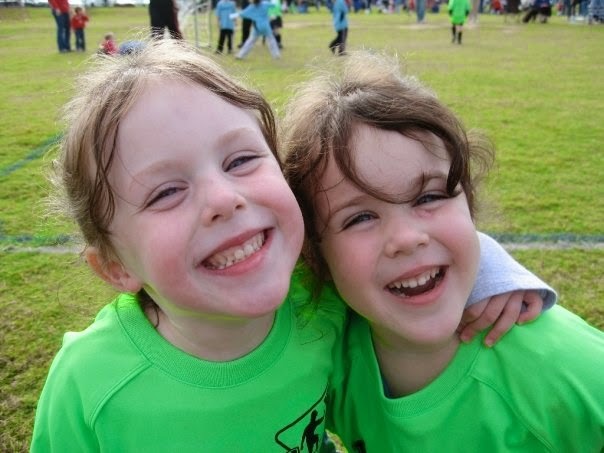 This means that they'll be on teams that compete outside of our local YMCA branch, and they'll begin playing some of the more competitive teams throughout the region. It also means that they'll be playing on the team for a full calendar year, and the amount of time I'll be sitting on the sidelines has increased dramatically. I don't mind in the least, though. 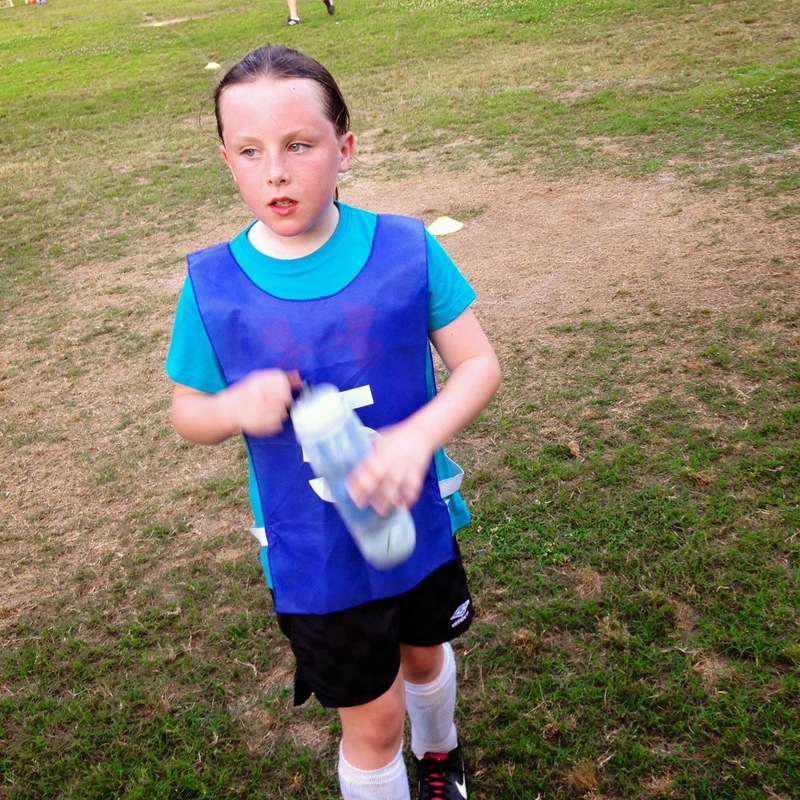 Watching my children play sports is by far the thing I love to do most in this world. Here are a few recent pictures to show just how quickly they are growing up! Introducing the Space Dust Quilt-Along! It's funny how these things come about sometimes. 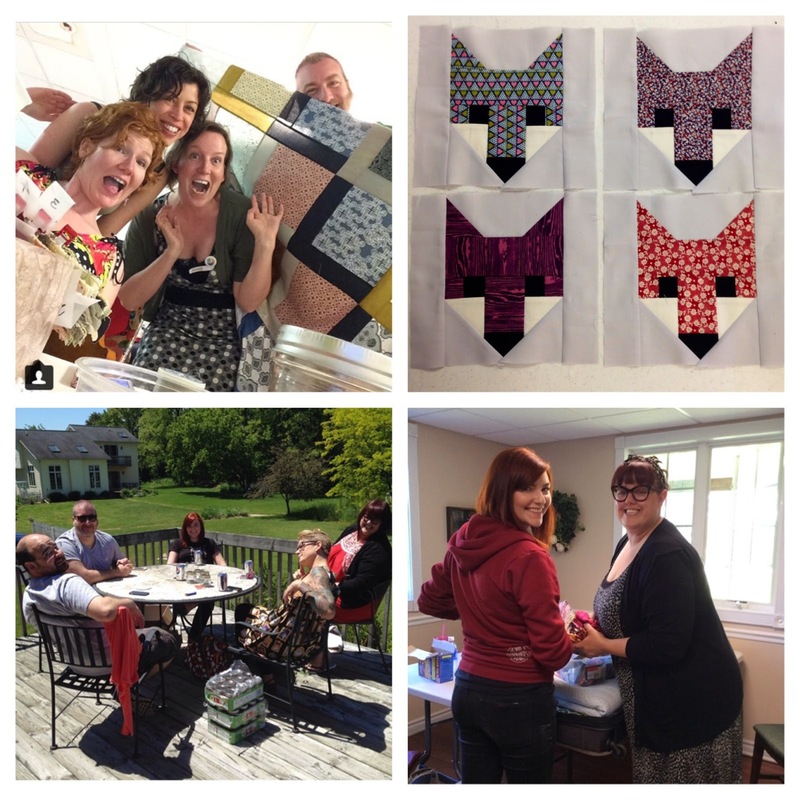 I was enjoying an otherwise innocent conversation over on Instagram (about quilts and fabric and such, of course) with Kela (from Quilter's Square), Paul (from Evildemondevildog Quilts) and some others. 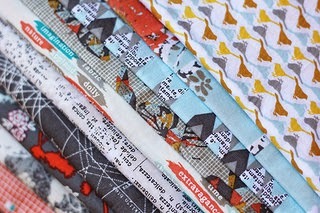 We were gushing about Katarina Roccella's new line for Art Gallery Fabrics, Indelible. I was also sharing that Tula Pink's Space Dust quilt was on my quilter's bucket list, and that I was contemplating starting it soon. It occurred to me that Space Dust made with Indelible would be pretty damn epic. Others agreed. A quilt-along was mentioned. And I was volunteered (volun-told?) to host it. I agreed, as I tend to do. 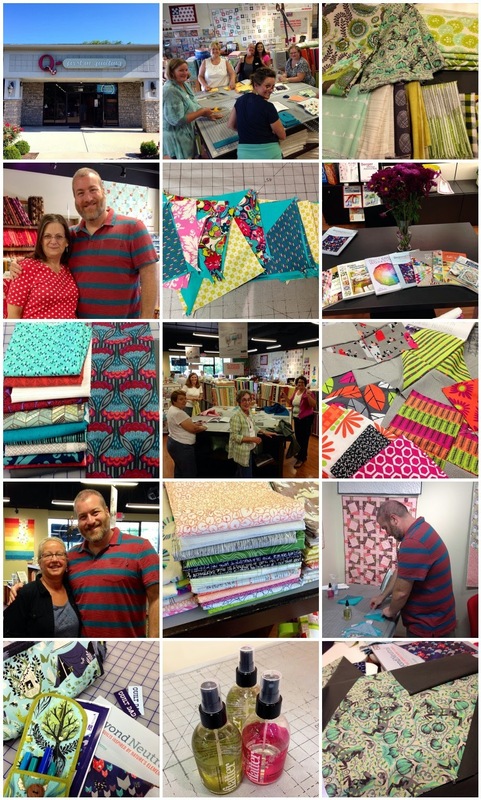 I recruited Paul to be my co-host, Kela offered to pull together quilt kits (at a discounted price! ), I asked Tula to offer a pattern discount to participants (she agreed! ), and the Space Dust Quilt-Along (#SDQAL) was born. I am hoping you'll join us on this journey! 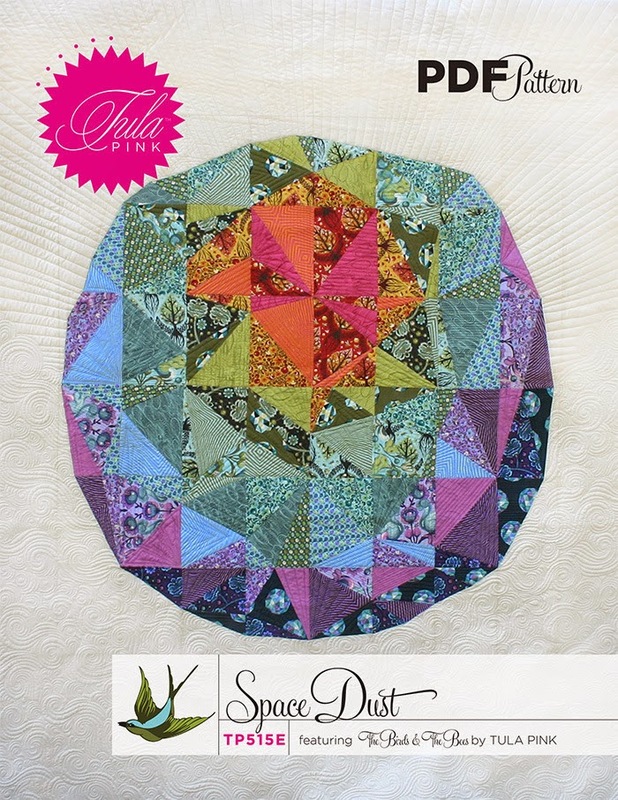 The Space Dust pattern by Tula Pink is a paper-pieced (foundation pieced) pattern. (Not English paper piecing -- aka hand work -- as some of you have already asked.) If you're unfamiliar, uncomfortable, or inexperienced with paper piecing and want to practice / get better, this is a GREAT pattern for that. It's fairly straightforward and Tula's instructions, as always, are amazing. The quilt finishes at 88" x 96". Link to purchase the Space Dust quilt pattern. 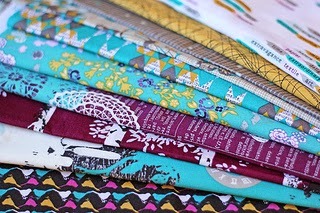 The quilting community is all abuzz with talk about Katarina Roccella's debut line with Art Gallery Fabrics, Indelible. Personally, I think it's much deserved. The line was a standout to me at Quilt Market in Pittsburgh and I've been (not so) patiently waiting to get my hands on some. And, given the prints and colors of the line, I think it will be an amazing complement to the Space Dust pattern. 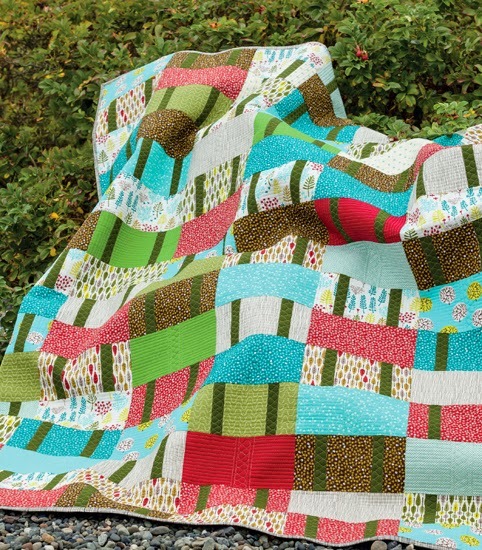 The pattern calls for 21 quarter-yard cuts of prints, so you can of course use any fabric you want for the quilt-along. It is not a requirement that you make your quilt from Indelible! If, however, you would like to use the line, Quilter's Square in Lexington, KY is making quilt kits and offering them at a discounted price. 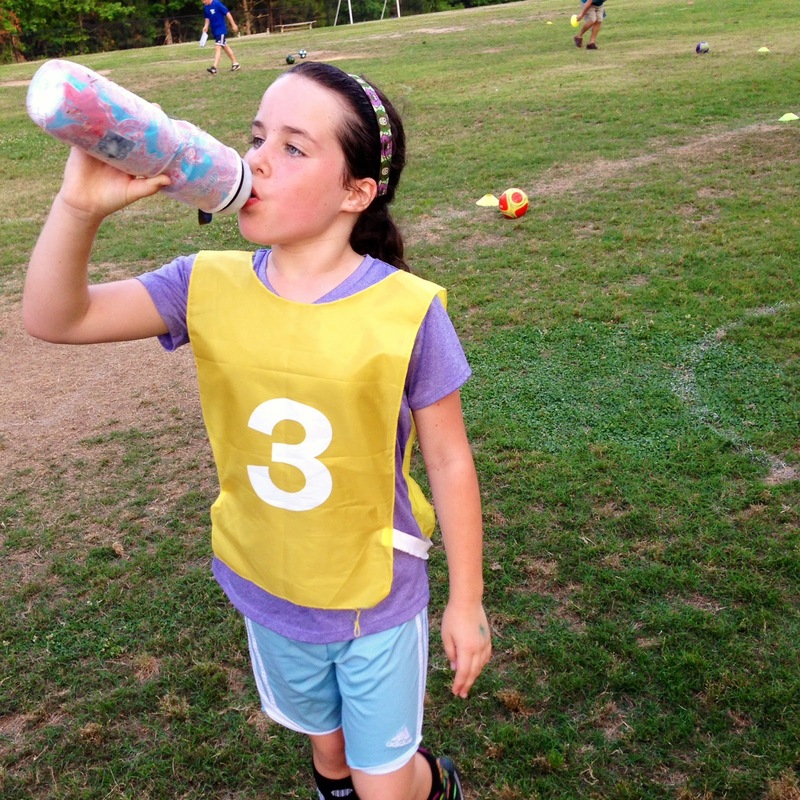 Kits are normally priced at $125.75, but are being offered for $100.00 for SDQAL participants. 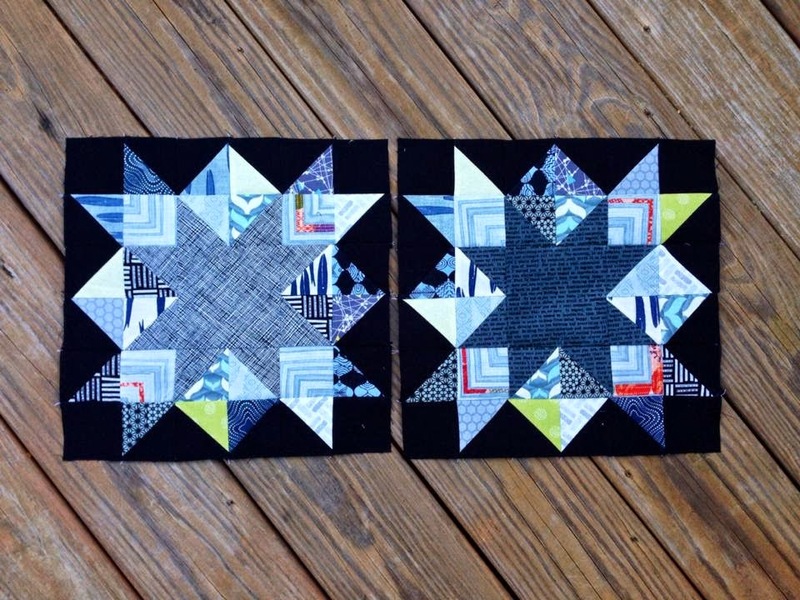 Link to purchase quilt kits from Quilter's Square. We'll be starting the quilt-along in a few weeks to give everyone enough time to collect their supplies, prepare their materials, etc. Paul and I will be alternating posts on our blogs (but I'll always link to his posts so that you won't miss anything.) The initial schedule is posted below. You will see that we will be posting on Fridays -- making it easier on you weekend warriors! -- and tackling the pattern row by row. 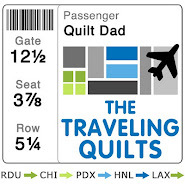 A note about quilt-alongs: the posts will always remain live on our blogs. If you need to get started a few weeks (or months or years!) late, no worries. You can always come back and follow the posts. Likewise, if you're a Speedy Sally and want to jump ahead, you are always free to do so. 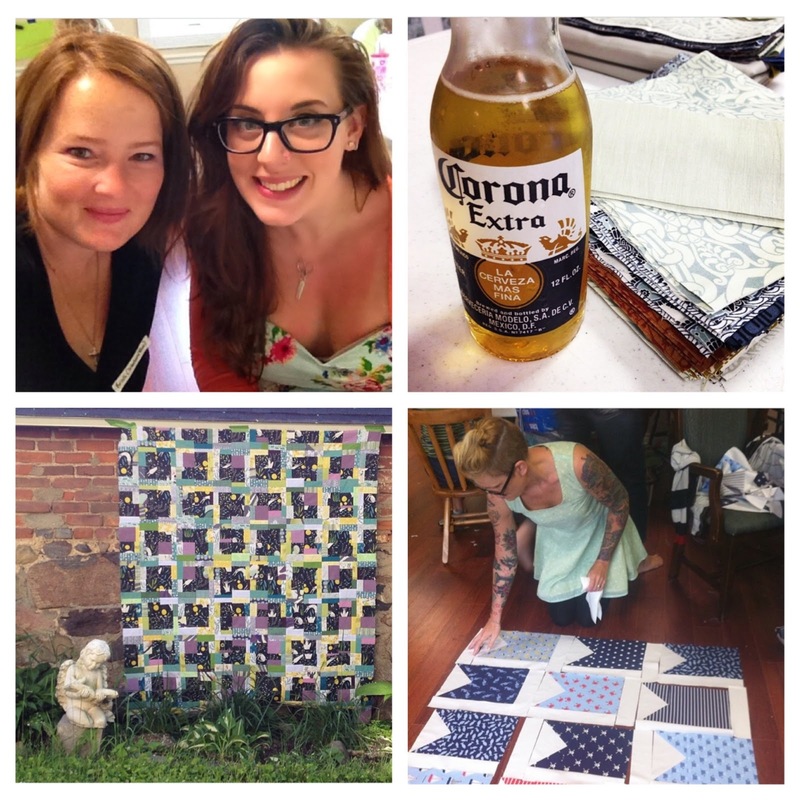 The quilt-along is simply a place for encouragement and fun picture-sharing to keep everyone motivated throughout. Of course, it wouldn't be a party without giveaways! Be on the lookout for fun giveaways to be offered throughout the quilt-along for anyone participating. If you're participating and you're active on social media, please be sure to share all of your progress on Instagram and Facebook with the hashtag #SDQAL. Feel free to start now with photos of your fabric ideas, your prep work, paper piecing tips, questions and requests for help, etc. 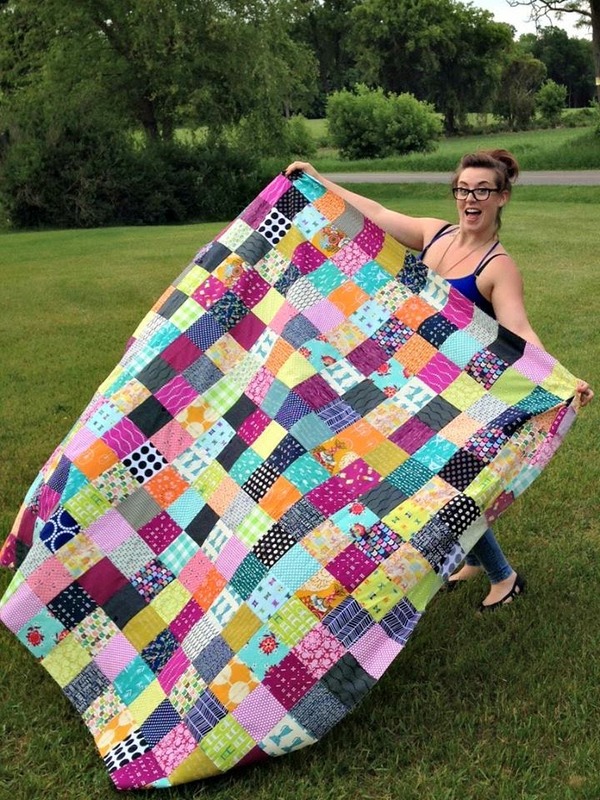 About 2 1/2 years ago, I wrote a blog post and called it "Can this quilt be saved?" In it, I recounted the story of a college friend who entrusted her husband's well-loved (but badly damaged) childhood quilt to me to see if I could somehow restore it so that it could continue to be enjoyed and appreciated by their own children. I must admit, I was a bit surprised by the responses that I received to that post. While I expected the posts that both admired my efforts and provided invaluable tips and advice on the cleaning and restoration process, I was a bit surprised by the number of people advising me not to try to alter the quilt too much and to avoid using modern fabrics in an effort to maintain the authenticity of the quilt. This being the first such project I had undertaken, I truly appreciated all of the feedback and it gave me a bit of pause as I decided how I wanted to proceed. Ultimately, I stayed the course and finished the project according to my original plan. I remembered that my friend entrusted the quilt to me, with the implicit understanding that she trusted my judgment and my aesthetic in bringing it back to life. My original plan to infuse life into the vintage panel by pairing it with more modern (though vintage-inspired) prints was very much in keeping with my personal design style. If I loved it, then I could be fairly confident that their family would too. Above, you can see a picture of the quilt after I was finished with my updates. I kept to a very simple courthouse steps / log cabin design in an effort to keep the focus on the sentimental middle panel. I absolutely love what the oliver + s prints brought to the project: a bit of whimsy with colors that really drew from the main panel. The quilt finished at a nice toddler / cuddle size. I hope it's very happy in its new home, and that its owners are too! While at Camp Stitchalot I had the pleasure of meeting Laura, Lin, and the gang from Q First in Quilting in Lexington, Kentucky. 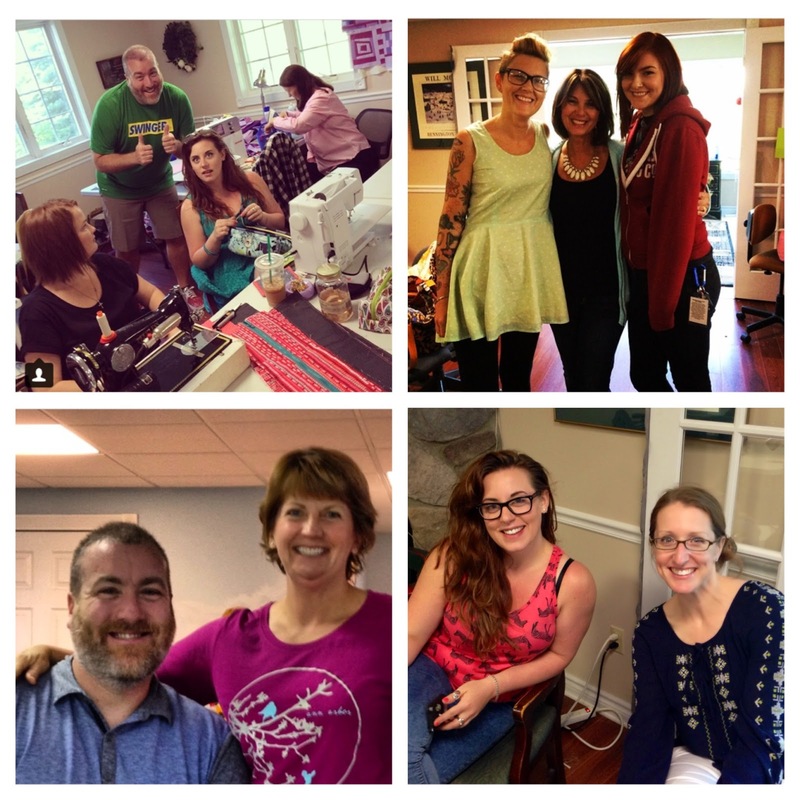 Good thing, because I was traveling to teach a class at their shop the following weekend! I headed to Lexington on Friday, July 13th, and was welcomed by Laura and Lin and some of their customers with a reception in their shop. (If you are in, near, or traveling through Lexington, I cannot recommend Q First in Quilting enough. It's a big, beautiful, airy shop with a killer selection of modern fabrics.) I was able to introduce myself, meet some new people, sign some books, and do a brief trunk show of all the quilts from Beyond Neutral. I also helped some students select and purchase fabrics for the next day's class -- my favorite thing to do! And Linda Peevy was the first to send me a photo of her completed quilt top. Linda used batiks to make her Pacific Crest quilt. Isn't it gorgeous? Thanks, Linda! 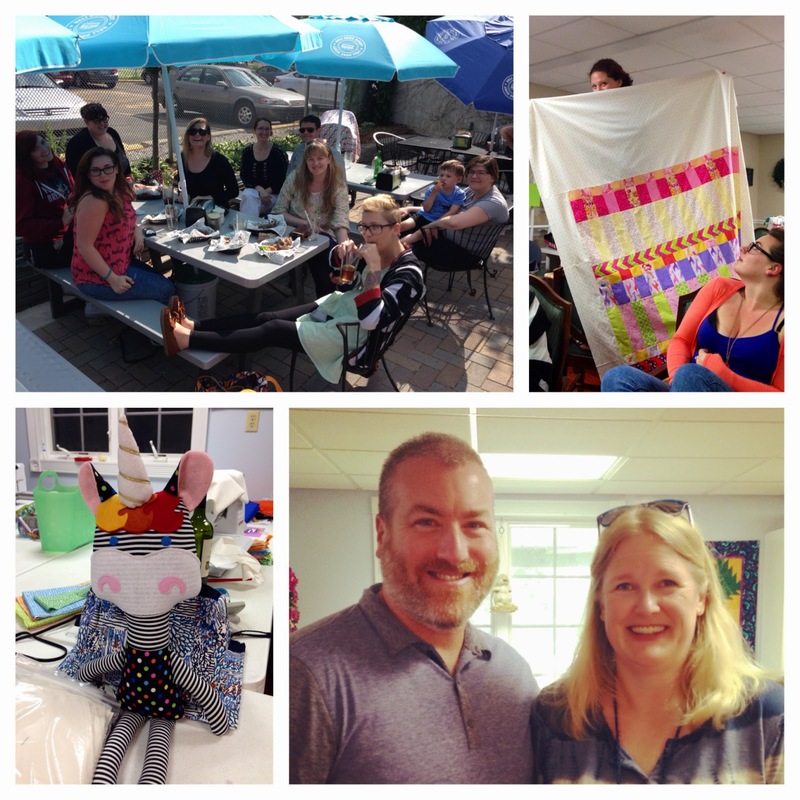 Shop owners and guild leaders: I am available for trunk shows, speaking engagements, and all-day quilt classes. If you are interested in learning more, please let me know. Quiet week here, so I thought I'd take another opportunity to share some more images from my book, Beyond Neutral: Quilts Inspired by Nature's Elements. 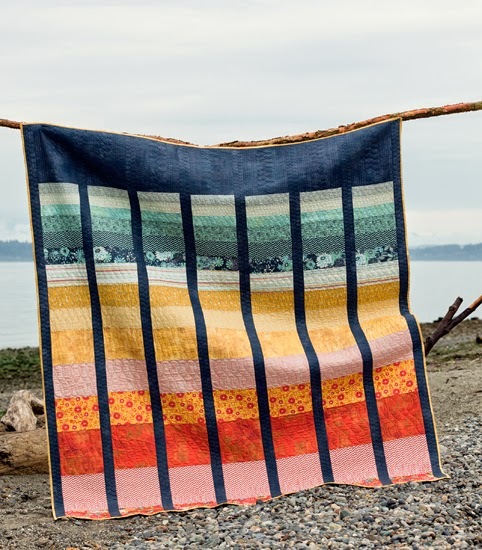 This first one is called Cape Lookout, and it was inspired by the view of sunrises and sunsets over the water. As you can tell by the photo, it's an easy quilt to piece together and a great showcase for your favorite collection of gradient prints. With Canyonlands, I took a free block pattern that I had designed for Generation Q magazine's blog a few years back (Modern Starlings, found here.) 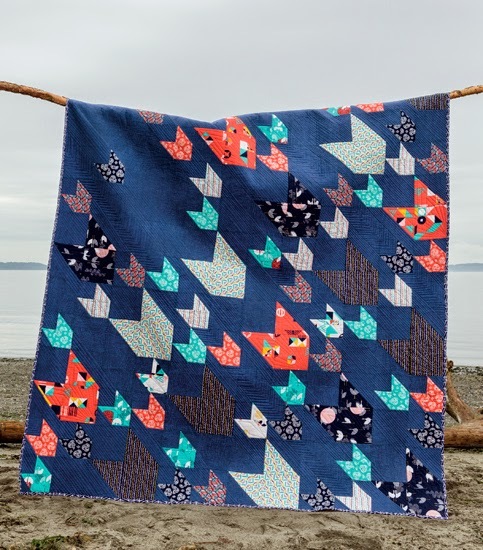 As soon as I designed the block I envisioned an entire quilt of starlings, and was finally able to realize it in my book. Today's third quilt is called Half Moon Bay, and in it I used my long-hoarded (and much-loved) collection of Cake Rock Beach fabric. 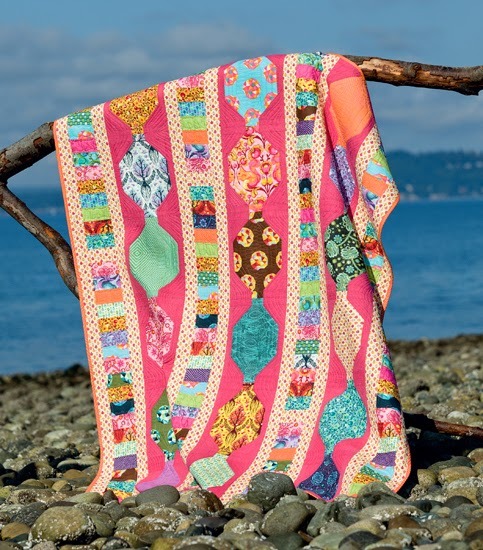 I love the graphic nature of this quilt and think that, with different colors and prints, the pattern can be taken in so many different directions. I hope you're all enjoying the book. If you've been able to browse through a copy and are so inclined, I always appreciate Amazon reviews of the book. 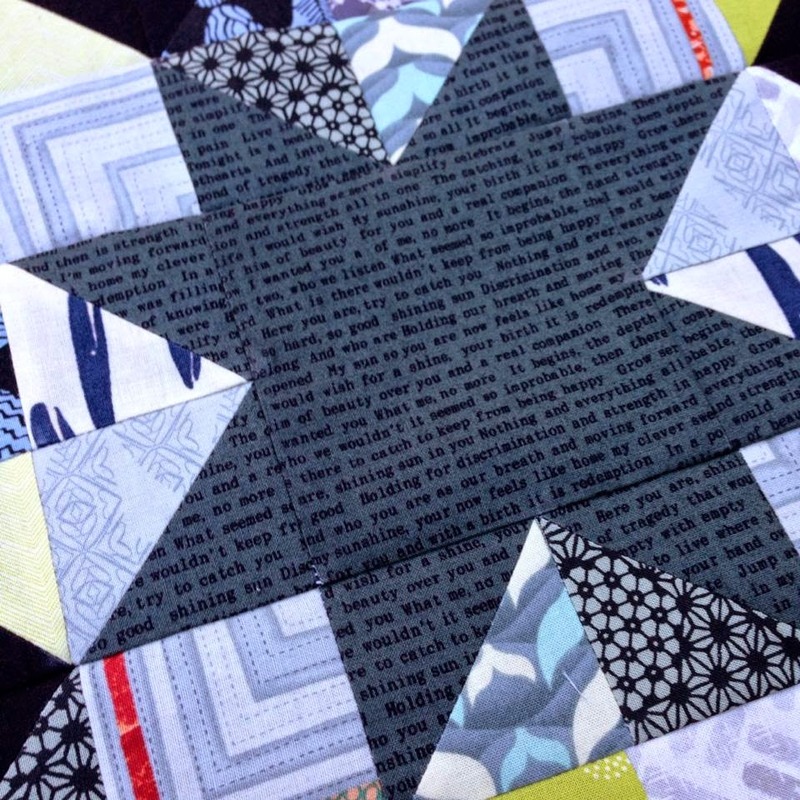 And if you've made anything from Beyond Neutral, please send me photos of your quilt tops. I'd love to feature them in future posts! Rather than bore you with all the details (that would take hours for me to write anyway), I'll share the story of Camp Stitchalot in pictures. Looks like the best time ever, right? If you thought that, you wouldn't be too far off. 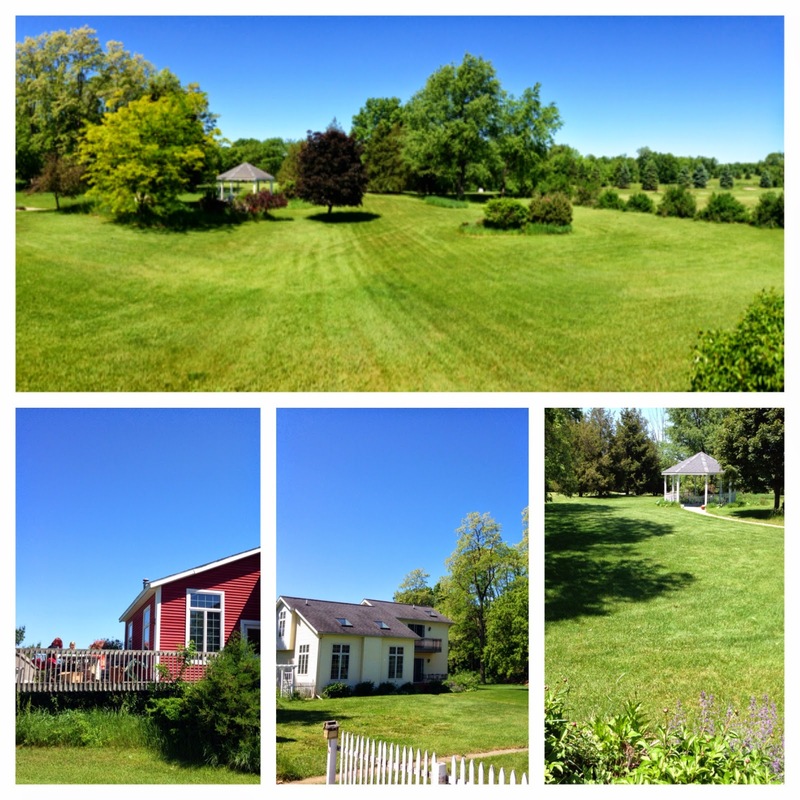 The setting was the beautiful, rustic, and humorously eclectic Hankerd Inn in Pleasant Lake, MI. It's a fantastic setting for sewing retreats, should you ever find yourself looking for one. Thanks again to Brenda and her team for inviting me to be a camp counselor. The weekend was capped off by a trip to the kingdom itself, Pink Castle Fabrics, where I emptied my pockets and left with a rejuvenated stash of amazing fabrics. I can't recommend her shop enough. I’m the other Andrew, or Mr. March. In a brief introduction about me, I would tell you that I sent to art school and concentrated in photography. I now work in healthcare, specifically as an aide in Intensive Care and Cardiac Services. Quilting was introduced to me by my mother a couple of years ago when I asked her to teach me, knowing she wanted to get back into it. I made one small table runner and one lap quilt then put my machine away, only to pick it up again 6 months or so ago. Thanks to social media, specifically Instagram, I started noticing more and more male crafters and quilters, and started to follow them and begin a conversation about an all-male quilt bee. And here we are. I chose the Inverted Star block (available on craftsy.com) because I haven’t yet worked with half-square triangles and wanted the challenge. 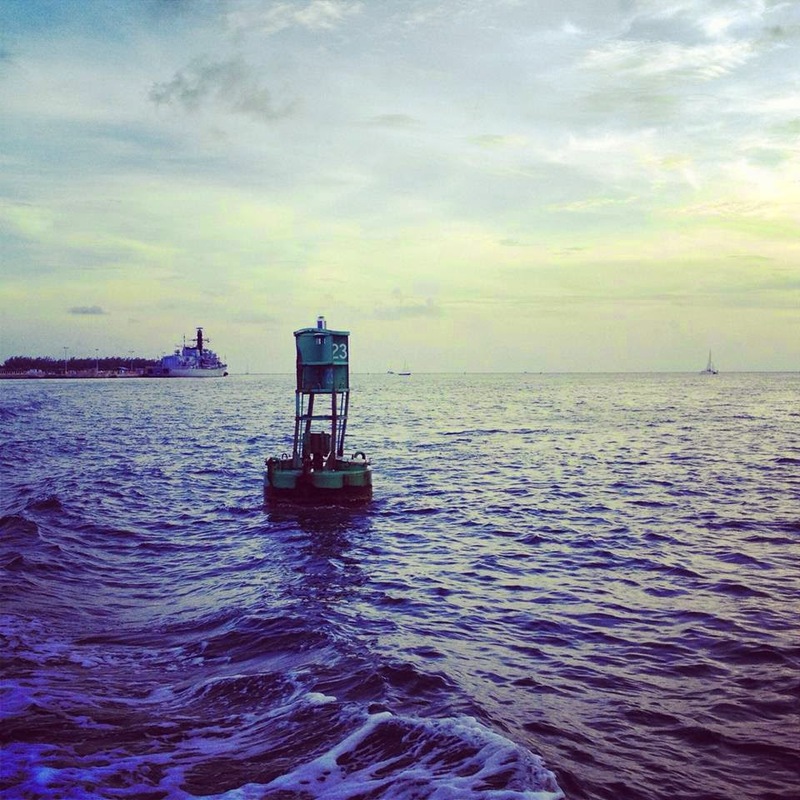 And I asked for the color inspiration to come from a photograph I took on my last trip with my husband to Key West. We’ve been there twice in the last year and love it. Asking for your help to commemorate this new favorite place of mine seemed appropriate. Thanks you all for the stunning blocks that I’ve already either received or seen online. They work you each produce is amazing and I’m glad to be a growing amateur in such an elite group of fun and talented craftsman! With the fabrics selected, the blocks were fairly straightforward to assemble. Lots of HSTs, but that's OK. I went with a completely scrappy layout rather than a more coordinated one, and I'm very happy with how the stars turned out. Can't wait to see Andrew's blocks all come together!